Remember to get yourself registered for the Inaugural APPLETREE Marathon, Half Marathon and Sunset 5K/10K on Saturday and Sunday September 15th & 16th with a “Run through History” theme. There is no better way to focus your training and solidify your commitment than signing up! The start/finish line will be on Officer’s Row in front of the historical Grant House and will travel through the Fort, past the Pearson Museum and Airport, past the oldest Apple Tree on the Pacific Coast, along the water front and through downtown past the Columbian newspaper which is one of the oldest locally, family-owned newspapers in the country operating since 1890. Since Kids 17 and under can register for the 5K for FREE and with a distance for everyone in the family, we want to provide training guidelines and a program to make sure everyone is ready for race day! People from all over the country will be using the APPLETREE Marathon to quality for the Boston Marathon and we want to come together as a community and be part of this historical event and highlight how amazing Vancouver is! Not everyone can do a Marathon, but we can all do a 5K! Register for any of the APPLETREE events using code “COLUMBIAN” to get 10% off. Here is Week 2 for each of the 3 different progressive training programs – two for the 5K and one for the Half Marathon. Remember to strength train to condition your muscles to be strong enough to absorb the impact of running. Listen to your body – if you need to walk more than the program allocates, do that. For those doing the Half Marathon training program, for your long runs, feel free to use the Galloway Method which involves 10 minutes of running and 1 minute of walking to complete the distance. That 1 minute walk every 10 minutes can really help your body endure the distance and the impact. It’s ok to complete any of these programs as a walker with no running whatsoever…just vary your walking speed so when the program calls for running, just walk faster. That will minimize the impact associated with running and be more tolerable for those more deconditioned, carrying extra weight or with joint issues/pain. PS. If you’d like an early test race 5K to measure your progress, the Columbia River Sunset 5K/10K is Friday August 17th. Use code ‘COLUMBIAN’ to get 10% off and Kids 17 and under race this one for FREE too! 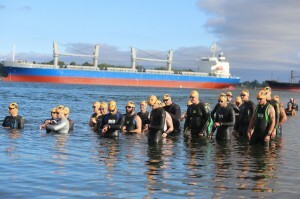 COLUMBIA RIVER TRIATHLON & ENDURANCE SPORTS FESTIVAL! YES, YOU CAN CROSS THE FINISH LINE!